“Since listening to words activates the language center of your brain, trying to engage in other language related tasks (like writing) would be akin to trying to hold a conversation while another person talks over you… while also strumming a guitar“. It is for this reason (and many more) that music is regarded as one of the triumphs of human creativity–but does music itself help one to create? People like me need to know. For nearly all of my work sessions, I have music playing in the background. I once wrote 10,529 words on customer loyalty (how exciting) listening to nothing other than the SimCity 2000 soundtrack–and yes, more on that later. This refers to the variability and creative demand of the task–writing a brand new essay from scratch is synthesis work that demands a lot of creativity; answering your emails is mundane work that does not. 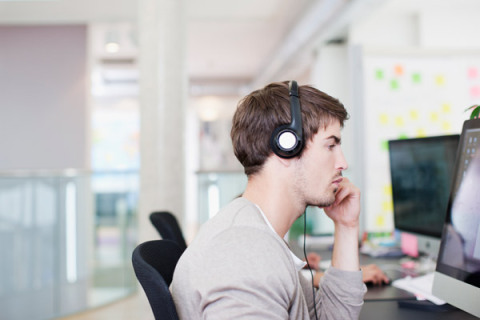 While the open space may encourage more collaboration, the chatter can be too much for some people to handle–I know that when I’ve worked in an open workspace, I couldn’t focus on writing without my headphones. Music demands too much of your attention–even when the sounds are subtle–to be listened to when you are trying to learn or analyze new information. In addition, most people tend to have a fairly wide range of music interests, so coming across or utilizing a certain type of music just for work isn’t out of the question–they needn’t always rely on what’s currently on their iPod.